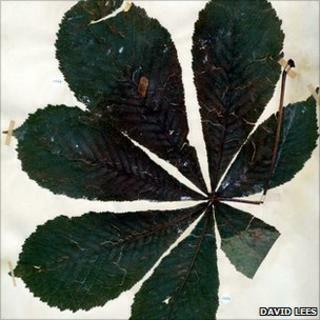 Horse chestnut leaf miners were living on natural stands of trees in Greece a century before they were first described by science, a study shows. The discovery was made by researchers who examined many of Europe's historic herbarium collections. They say it offers an insight to the history and origins of the tiny moths, which are blighting many of the continent's horse chestnuts. "It is a moth that has been the target of a lot of research recently because it has been expanding [its range] so fast - much faster than other kinds of leaf-mining moths," explained co-author David Lees from the French Institute for Agricultural Research (INRA). The larval form of the Cameraria ohridella moth feed inside the leaves of the white flowering horse chestnut tree (Aesculus hippocastanum), producing characteristic "mines" between the leaves' veins. The creatures do not kill the tree but infested trees may produce smaller conkers. Dr Lees said C. ohridella was spreading its range by about 60km (40 miles) across Europe each year. The small but highly invasive moth was first discovered in 1984, and first described by scientists as a genus new to Europe in just 1986. Since then, it has expanded its range across almost all of Europe. "We recently marked the first quarter century of this blight on horse chestnuts and it is quite amazing that during this time its origin has remained a mystery," noted Dr Lees, a scientific associate with the Natural History Museum in London. "We decided to look at whether specimens of the moth appeared in herbarium collections, so I contacted (co-author) Walter Lack at Berlin Botanic Garden, who had been studying the history of this tree in Europe. "I asked him whether he had come across any mines in his historic herbarium collection. He wrote straight back and said that he did have some, which had been collected in 1928 in Albania. He said that there were spots on the leaves but he had no idea what they were." Dr Lees admitted he was very excited when he examined photos of the specimens and saw the outline of a caterpillar mine. "That's when we started to look more widely," he went on. "I went to Kew Gardens (London) and as I was looking through the herbarium there I found a specimen from 1879 which had mines in it. We just could not believe it." They also found examples of leaf miners on collections in Paris. Dr Lees said some of samples of leaf mines had been hidden, as the result of proud botanists attempting to disguise blemishes on their prized leaves. He also felt there was another reason why the discovery had not been made before: "Disciplines stick to what they know best so entomologists would not necessarily go to herbariums." He explained that the tree has been transported from its native Balkan range and planted throughout Europe since the late 16th Century, so mystery had surrounded why the moth had not "caught up with its dinner sooner". "We know that this moth has been distributing very fast since the last 1980s, ever since it somehow got to Austria," Dr Lees said. The arrival of roads in areas within the moths' original range played a part, he suggested. "The pupae hibernate in the mine (on a leaf), and they are able to be transported in trucks." Before this, the distribution was unlikely to have be widespread because the moths were not able fly far enough to extend their range.